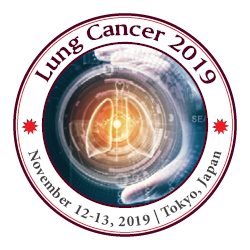 Conference Series is esteemed to invite you to join the International conference on Frontiers in Lung Cancer which will be held from November 12-13, 2019 at Tokyo, Japan which includes prompt keynote presentations, Oral talks, Poster presentations and Exhibitions. The International Conference on Frontiers in Lung Cancer is the world’s largest meeting dedicated to lung cancer. This trending event which brings together efficient international academic scientists, young researchers, pulmonologists, radiologists, pathologists and students making the congress a perfect platform to share experiences and knowledge, gain and evaluate emerging technologies in Lung Cancer Treatment and Research across the globe. Initiation of cross-border co-operations between scientists and institutions will also be facilitated. The main theme of the Conference is “Prodigious Discoveries in Lung Cancer”. We anticipate an energizing 2-day scientific event, entrepreneurship meeting, poster presentations, exhibition, and keynote presentation in the charming city of Tokyo. The International Conference on Frontiers in Lung Cancer With members from around the world focused on learning about the status of cooperative group trials that are assessing emerging strategies to treat lung cancer this is your best opportunity to reach the largest assemblage of participants from the Lung Cancer community. Conduct presentations, distribute information, meet with current and potential scientists, make a splash with new developments and research, and receive name recognition at this event. World-renowned speakers, the most recent techniques, developments, and the newest updates in Lung Cancer, treatment, surgery, care and the newest inventions to cure the Lung cancer involved are hallmarks of this conference. Bronchial adenoma is a rare type of cancer that starts in the mucous glands and ducts of the lung airways or trachea, and in the salivary glands. Though "Adenoma" means a noncancerous tumor, most bronchial adenomas are cancer and can spread to other parts of the body. Yet they often grow slowly and are treatable. Only a fraction of cigarette smokers develops lung cancer, suggesting that people differ in their susceptibility to this disease. We investigated whether differences in DNA Repair Capacity (DRC) for repairing tobacco carcinogen-induced DNA damage are associated with differential susceptibility to lung cancer. Small cell lung cancer (SCLC) makes up less than 20% of lung cancers and is typically caused by tobacco smoking. It often starts in the bronchi, then quickly grows and spreads to other parts of the body, including the lymph nodes. Non-small cell lung cancer (NSCLC) makes up about 85% of diagnosed lung cancers. This includes all kinds of epithelial lung cancer excluding the small cell lung carcinoma types and are generally more insensitive to chemotherapy. Lung cancer symptoms may include chronic cough, breathing changes, chest ache, wheezing, hoarse voice, tiredness, weight loss, headache and even bone pain. In certain chronic lung diseases, people with lung cancer don't have symptoms until the cancer is advanced. Lung disease ranges from bronchitis and pneumonia to pulmonary hypertension. Lung function tests and X-rays are used to diagnosis the problem. Many symptoms can be eased with proper treatment. If not treated they may directly or indirectly lead to lung cancer. Alpha-1 antitrypsin lack is a hereditary issue that causes faulty creation of alpha-1 antitrypsin (A1AT), prompting diminished A1AT movement in the blood and lungs, and affidavit of intemperate irregular A1AT protein in liver cells leading to lung illness and liver infection. Influenced people frequently develop emphysema, which is a lung infection caused by damage to alveoli. Alpha-1 antitrypsin deficiency is a genetic disorder that may result in lung disease or liver disease. Onset of lung problems is typically between 20 and 50 years old. This may result in shortness of breath, wheezing, or an increased risk of lung infections. Epidermal growth factor receptor (EGFR) – the EGFR gene is responsible for a protein that helps a cell respond to its environment and can trigger cell growth, division, and survival. KRAS – the KRAS gene is involved in regulating cell division. Anaplastic lymphoma kinase (ALK) – the ALK gene provides instructions for a protein that plays an important role in cell growth, division, and maturation. Acute Respiratory Distress Syndrome, is a lung condition that leads to low oxygen levels in the blood. ARDS can be life threatening because organs, such as the kidneys and brain, need oxygen-rich blood to work properly. Most people who develop ARDS are in the hospital for other serious health problems. Rarely, people who aren't hospitalized have health problems that lead to ARDS, such as severe pneumonia. Causes of ARDS includes infections, injuries, or other conditions that cause the lung's tiny blood vessels to leak more fluid than normal into the lungs' air sacs. This prevents the lungs from filling with air and moving enough oxygen into the bloodstream. Although primary lung tumor is rare in the pediatric population, a wide range of histopathological tumor types occur comprising mainly of broad spectrum of lesions. The most common type of primary lung tumor in children includes carcinoid tumor and pleuropulmonary blastoma. The latter is a rare lung cancer affecting primarily children and adolescents. The implementation of molecular biomarkers in routine practice continues to be challenging. First, physicians must know which biomarkers should be analyzed in routine practice and be aware that additional markers may soon become standard. In this context, regularly updated guidelines can support physicians in their decisions. Nevertheless, clinical implementation of molecular biomarkers may differ among regions based on prevalence of the biomarker, availability of test methods, and access to corresponding treatments. Lung cancer screening tests include chest X-rays, CT scans, and sputum cytology. Research is still being done into the effectiveness of screening since there are several types of lung cancer, some of which are hard to detect. Screening may not reduce mortality in lung cancer patients. One downside to testing is that false positives can result in unnecessary further tests that may have adverse effects. The detection and diagnosis of lung cancer and COPD can be evaluated by performing the following tests: spirometry, chest radiography, chemotherapy, immunotherapy, CT scan, arterial blood gas analysis, complete blood count, transthoracic ultrasonography and lung function tests. Spirometry measures the amount of airflow obstruction present and is generally done after the use of a bronchodilator. An arterial blood gas test measures the oxygen level in blood and the result can show how severe COPD is and whether patient need oxygen therapy. The differential diagnosis is also performed for testing the asthma, congestive heart failure and pulmonary embolism. Lung cancer can rarely be detected in its earliest stages, when treatment is more likely to result in a cure. By the time symptoms appear, it’s often too late for curative surgery, leaving only treatments that aim to improve quality of life. Although researchers have made remarkable progress in chemotherapy for all stages of disease, most people diagnosed with symptomatic lung cancer do not survive. Over the past 50 years, the U.S. has seen an encouraging decline in the prevalence of smoking, through aggressive anti-tobacco campaigns and policies. However, this decline now appears to be slowing, while an unacceptably large population is at risk from lung cancer. Lung cancer is responsible for nearly 30 percent of all cancer deaths each year —more than that of breast cancer, prostate cancer and colon cancer combined. As the prime cause of cancer-related deaths in the nation, lung cancer receives far too little attention. Even after careful selection, considering the stage, location and cell type of the cancer, the operative death rate of lung cancer surgery is about 4.4%. Hence surgery is only suitable for NSCLC stages 1A, 1B, 2A and 2B. In thoracotomy, the surgeon generally opens up the chest cavity by making an incision in the side of the chest and by spreading apart the ribs to gain access to the cancerous tissues. Radiotherapy is often accompanied with chemotherapy to people with NSCLC who are ineligible for surgery. Continuous high fractionated accelerated radiotherapy (CHART) is recommended for people with NSCLC while chest radiotherapy is recommended for people with curable SCLC in addition to chemotherapy. Palliative radiotherapy to the chest is applied to both patients of NSCLC and SCLC to control the symptoms. With the help of targeting and imaging technologies, stereotactic radiation is used to treat early stage lung cancer. Depending on the type of tumor, chemotherapy is used as the first-line treatment in both SCLC and NSCLC. Cisplatin and etopside are used along with radiation to treat early stage small cell lung carcinoma. They are also used in combination of carboplatin, gemcitabine, paclitaxel, vinorelbine, topotecan, and irinotecan. While in advanced non-small cell lung carcinoma, cisplatin and carboplatin are used to improve survival rates along with gemcitabine, paclitaxel, docetaxel, pemetrexed, etoposide and vinorelbine. Targeted therapy hinders the growth and spread of cancer cells by targeting specific genes or proteins of cancerous cells. The research to improve outcomes for patients with NSCLC has only just begun by developing treatments to target additional pathways. Since all tumors don’t have the same target, a lot of tests have to be conducted to identify the genes, proteins and other factors in the tumor to deliver the most effective treatment. Bevacizumab, Ramucirumab, Necitumumab, Afatinib, Erlotinib, Alectinib, Ceritinib, Crizotinib and Brigatinib are some of the drugs used in clinical trials for targeted therapy for lung cancer. When other therapies are ineffective, immunotherapy may offer significant benefit to lung cancer patients. Immunotherapy uses materials made inside body or in a laboratory to boost the body’s natural defense system against tumor cells. The immunotherapy drugs, nivolumab (Opdivo) and pembrolizumab (Keytruda) are checkpoint inhibitors that target the PD-1 protein, which strengthens the immune response against the cancers. Atezolizumab (Tecentriq) is a drug that targets PD-L1, a protein related to PD-1 that is found on some tumor cells and immune cells. A better understanding of the role of immune checkpoints in the cancer immunity cycle and advancements in computational and bioinformatics platforms enabled the development of cancer neoantigen vaccination strategies. Those improvement in the treatment for lung malignancy may be quickly Extending for those worldwide showcase. The current report card keeps tabs on the around the world lung malignancy diagnostics showcase to those estimate run through of 2015 on 2020. This showcase will be required will scope $13.1 billion Toward 2020 from $7.1 billion crazy for 2015 Furthermore may be primed will create toward An CAGR about 12.9% Throughout the assessed run through. The overall harm diagnostics market will be setting off with achieve An fast progress by making a remarkable progression in the field for engineering organization identified with oncodiagnostic advertise.